Out of all the reasons why most people experience that they cannot stick to a healthy plant-based diet is that they have no clue what to prepare when they have only a couple of minutes to whip up a snack or lunch, mind you coming home from work too tired to cook an elaborate meal. 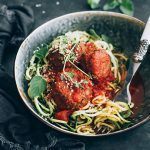 If you, too, feel like you have no time and need a bunch of quick and simple vegan recipes in your repertoire, then this article will be a true savior! This shouldn’t come as a surprise, right? If you don’t have enough food at home, you cannot prepare anything. We recommend you get some fresh veggies like lettuce, tomatoes, bell pepper, mushrooms, carrots, zucchini, and cucumber. They can be enjoyed raw or thrown into a quick stir-fry and be ready in just a few minutes. Definitely get a variety of starches: rice, couscous, oats, polenta, wheat berries, barley, buckwheat, quinoa, potatoes, and sweet potatoes are a few options. Tortilla wraps, pasta, and bread also offer lots of choices. Pick what you prefer. Then get some beans and lentils, canned or frozen if you want more convenience. Frozen bags of veggies will also come in handy! Finally, fresh fruit is the quickest and healthiest snack ever. See what’s in season and what you like most. Tip: blueberries take less time to “prepare” than let’s say mango or pineapple. Dried fruit, nuts and seeds are also good to have at home. Here’s a l﻿ist of our personal vegan staple foods! As a general guideline, we prepare meals at home like this: we choose one starch which we cook in bulk (like rice, millet, wheat berries or pasta) and then prepare different meals every day with it. When we use rice, we might make an Asian oil-free stir fry with tofu the first day, a tomato curry the next, and a quick ﻿sushi bowl the third day. Using millet, we cook up some Italian-flavored veggies (like zucchini, eggplant, bell pepper, tomatoes) the first day, put the cold millet in a soup the second day, and mix it with beans, cucumber, and other raw veggies the third day. Another option would be to choose pasta which you can enjoy with lentil Bolognese or marinara sauce the first day, then prepare a pasta salad the next, and have a casserole with some random veggies and sauce the third day. Similar to the leftover option is cooking your whole meal in a huge bulk and eat it every day for a couple of days in a row. You could also freeze half of it to have a ready-made meal you can defrost at your convenience sometime later. Bulk cooking is a great idea for preparing lunches on the go: think grain salads, bean soups, baked sweet potatoes, casseroles, vegan meatloaf, curries, chilies, vegan meatballs or lentil burger patties. All of these make quick dinners, too. You just need to set aside 30-60 minutes twice a week and prepare one of the meals mentioned here! If you want to get into meal planning, check out our how-to guide here. 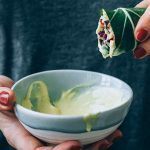 Now that we’ve established these strategies, let’s get more actionable and take a look at the specific meals we would create if we don’t have much time or want to prepare a few days in advance. You'll notice that they are almost always based on starches or contain starch - that's because this is the best source of energy, not just for vegans. By focusing too much on calorie dilute veggies and fruit, you'll sooner or later become ravenous and all good intentions will be out of the window. The holy combo! Nothing’s cheaper and more convenient. 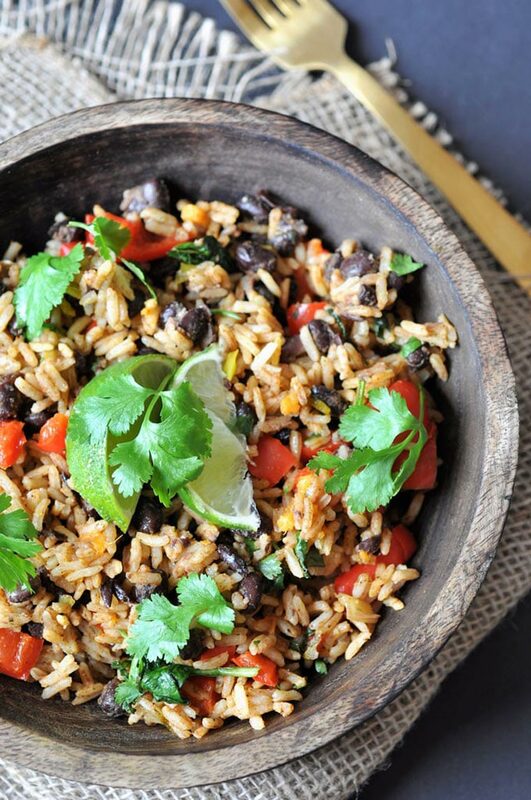 You can pick white, brown, red, black, or white rice and combine it with kidney, black, pinto, or white beans, chickpeas, even peas or lentils. For a quick round-up Mexican-style, we like to add some corn, salsa, avocado, hot sauce, bell pepper, and tomato. Here's an exact recipe for you! Another very convenient meal – if you can get your hands on some pre-cooked grains which we would suggest you almost always have in the fridge. It just takes getting out a larger pot when you want to make some rice/wheat berries/millet/quinoa the next time and making double or triple the amount. Combine your cold (or even slightly warm) grains with some leafy greens, chopped tomatoes, onion, bell pepper, apple, nuts or seeds, dried fruit, legumes of choice, maybe even steamed veggies. Then, mix together your favorite dressing or pour over a store-bought sauce and you’re ready to go! It can be a good idea to store the dressing separately if you don’t want your salad to be drenched, though we sometimes like that consistency. Store in your fridge for up to 3 days and eat whenever you feel like it! Examples for great concoctions include a warm millet salad, curried rice salad with black beans and mango, and an avocado quinoa salad. There’s also our potato salad – technically not a grain but similar in preparation and satisfaction. Longing for some satisfying complex carbs but nothing’s cooked? Get out your polenta or couscous, put it into a bowl and pour over hot water. Just let it sit for around 10 minutes, stir it so everything’s getting soaked, and you’re done! In the meantime, you can microwave, roast ,or sautee some veggies to go along with it or chop up some cucumber, avocado, and tomato and have them alongside your starch – maybe with some fresh herbs and a sprinkle of lemon juice? Canned beans are also a nice add-on. Or would you like to satisfy your sweet tooth? Chopped apple, pear, raisins and dates with cinnamon and some plant-based milk is delicious. Or go the berries and almond route, totally up to you! Everyone loves wraps! Check out your store for the healthiest choice of prepared tortillas or lavash bread (just basically something to roll up your stuff). You could also use lettuce or collard greens/swiss chard (the latter two can be blanched first). We like to stick with the starchy options for more energy and satiety. When hunger hits, get out your tortillas/greens, spread some hummus or guacamole on it and stuff it with veggies, tofu, beans, corn, and grains of your choice. Another idea would be to go the Thai instead of the Mexican route here! Top with spices and some lemon juice if you like. And if you want to switch things up a little bit, use nori sheets instead of flour tortillas. If you’re one of the lucky people whose grocery store offers frozen plant-based meals, you might want to pick up a few of them in case of emergency. Not all are unhealthy for you and filled with preservatives - just check the ingredients to see which ones you’d like to try. Oftentimes, it’s just some chopped veggies with corn, beans, rice or potatoes – microwave it, toss in some soy sauce, teriyaki, hot sauce or ketchup and you’re ready in just a few minutes. You can have it over precooked grains, too: see, you can use that stuff all the time! Definitely have some precooked grains in the house. 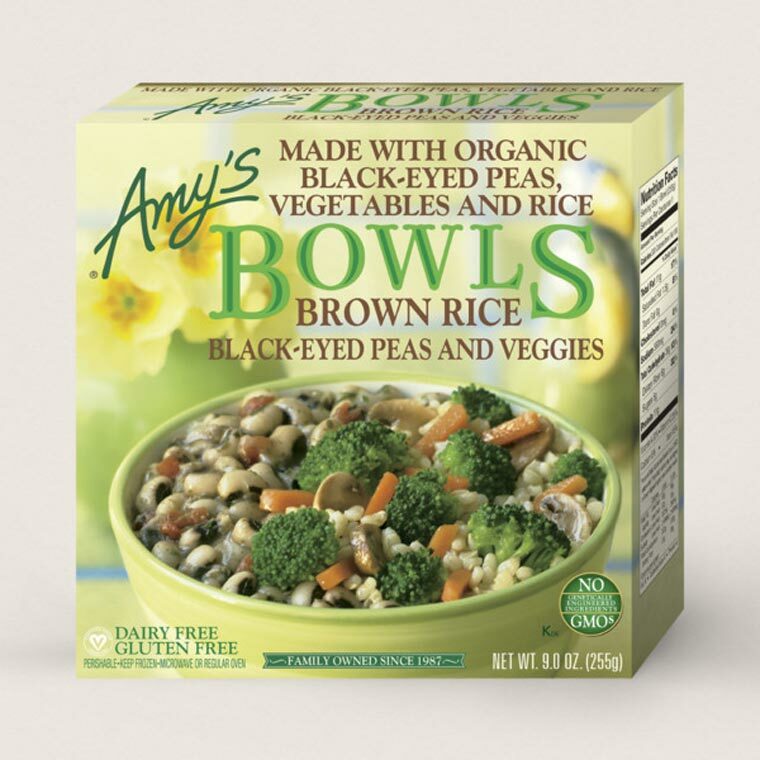 Brands to look out for are Amy’s and Trader Joe’s meals. Here’s a thorough list of options! If you come across a good deal on sweet potatoes, load up on them! Baking these nutrient powerhouses on a sheet in an oven for around 40 minutes (depending on their size) and then storing them in an air-tight container can offer you tasty and healthy snacks. You can even create a sweet breakfast or snack by putting some nut butter, cinnamon, and fruit onto the sweet potatoes! Another option would be to microwave a regular medium-sized potato for around 3 minutes, cut it open and top it with some beans, salsa, corn, and avocado. You might want some greens with that, too. Sweet potatoes can be a delicious base for your savory meals as well, of course! Craving some Italian comfort food but no time or ingredients for an old-fashioned pizza? Have some pita bread at home (which, by the way, you could also use similarly to tortilla wraps by putting the fillings inside). You just have to spread some tomato sauce or paste on it and top with any veggies you find in your fridge – we like onions, tofu, tomatoes, zucchini, and basil or mushrooms, tomato ﻿﻿sauce, and bell pepper. You can either bake it right away at 350°F for 5-10 minutes or sprinkle some nut cheese on top first. 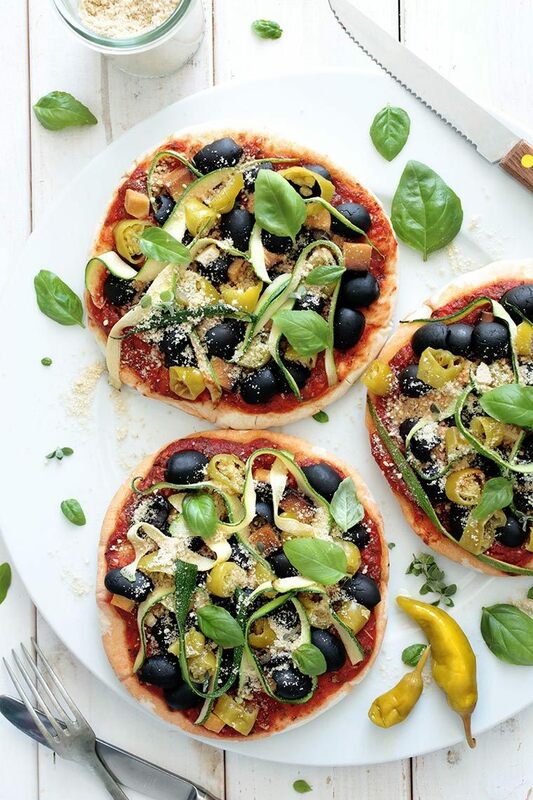 Other delicious variations are the Thai vegetable pizza and the Indian spiced pizza. Happen to have some ready-made pizza dough in the fridge? Lucky you, just a couple more minutes in the oven and dinner will be ready. This one’s a classic for sure! Have some whole grain sourdough bread or toast in your kitchen, maybe a couple of pieces in your freezer if you don’t use it up quickly enough, to prepare a quick sandwich whenever hunger hits. The sky is your limit when it comes to different options here: have some peanut butter, almond butter, hummus or other bean/lentil spread, avocado, guacamole, baba ganoush, mustard, soy yogurt, vegan tofu cream cheese spreads which you can then top with your fruits and veggies of choice. Peanut butter with banana is simple and delicious, so is hummus with avocado, tomato, pepperoni, and some sprouts . You might have heard of chickpea sandwiches which are a must try. Use from your variety of fresh or cooked veggies to stuff into your sandwiches and create some satisfying goodness! 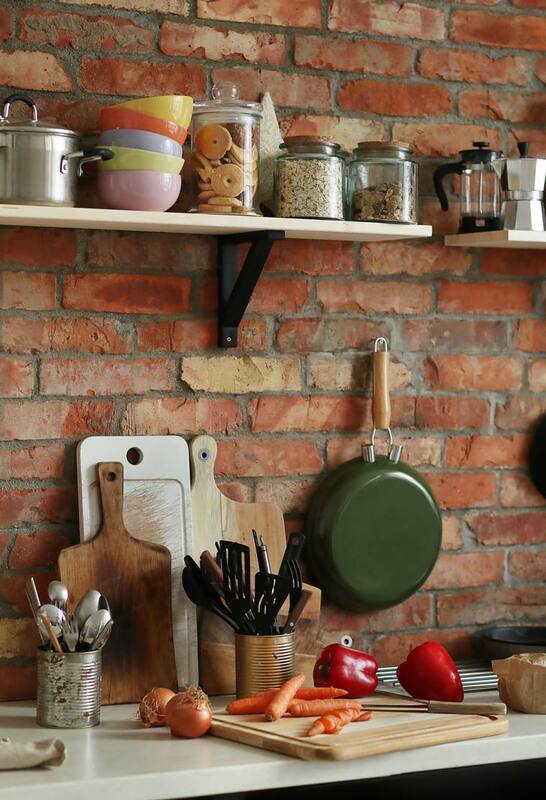 Tip: add some spices or fresh herbs for taking it to the next level. Here’s the ﻿﻿﻿ultimate list of sandwich variations! 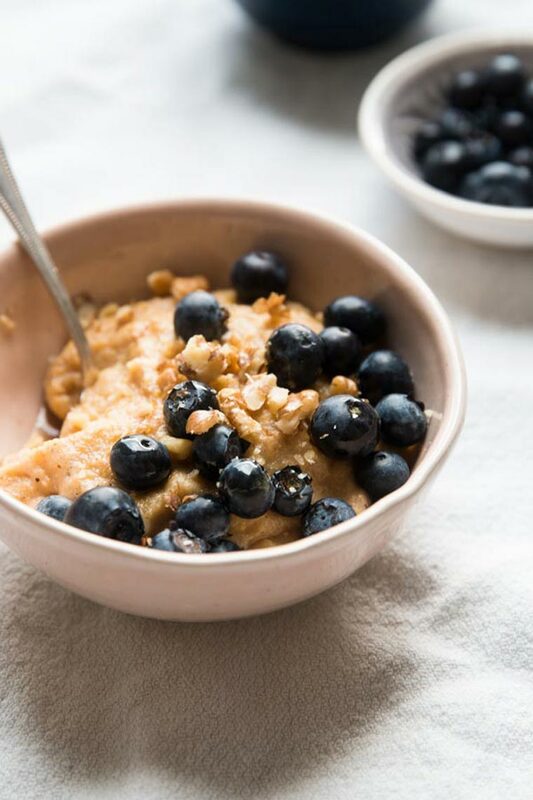 There’s probably no starchy base you can prepare as quickly as some good old fashioned rolled oats – maybe instant oats, we’ll give you that. We sometimes like to just put some rolled oats along with a banana and some nuts into a small bowl, pour plant-based milk over it and munch away! Very satisfying. During summer, we also add a few frozen berries or frozen mango pieces straight into it. You could even make a savory version with beetroot, kale, and nutritional yeast or turmeric, carrot, and roasted red peppers! If you have a few more minutes to spare, how about grinding some oats (you can use a high-speed blender for that) and make a b﻿﻿lueberry mug muffin? Or how about using these ground oats to make a batch of cookies for the next few days? It’ll just take under 30 minutes in total. Versatile, healthy, fresh and good if you’re on the run – smoothies are delicious and come in super handy. We always suggest you take some ripe bananas for a creamy and sweet base, add another fruit of choice (we love frozen berries or mango), a handful of greens and some flax or chia seeds. If you want it to be more filling, you can also add some rolled or instant oats here. Peanut butter or stevia add flavor and richness. Fill up with some water or plant-based milk (juice can be a nice touch as well!) and blend it all up! You can make them savory, too, if you go the kale-carrot-ginger-spinach-lemon route. There are also s﻿﻿weet kale smoothies by the way! These thick beverages are also helpful when you want to increase your fruit and especially vegetable consumption the tasty way. If you'd like it to be even more convenient, prepare some freezer smoothie packs in advance! And if you are looking for something to munch instead of sip, use less liquid and create a delicious smoothie bowl that you can top with anything from fruit to nuts, seeds, granola, cacao nibs and more. Did you get some of these tortillas we talked about? Well, the small ones can be warmed up in the microwave between two sheets of moist paper towels and filled with some goodness in just a couple of minutes. 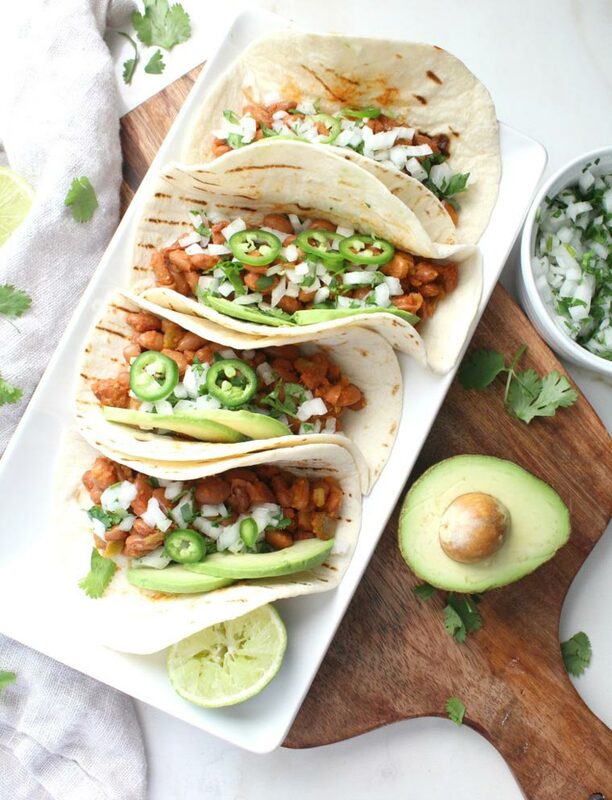 To create a delicious vegan taco, use fillings like beans (of course! ), lettuce, tomato, avocado, and salsa. Add fresh cilantro, chili powder and cumin for the typical flavor if you have it on hand! Leftover rice could be added as well. Our favorites are a quick pinto bean and avocado version, lentil cauliflower tacos, and beetroot kale tacos. We love soups because you can freestyle so much when it comes to the ingredients! 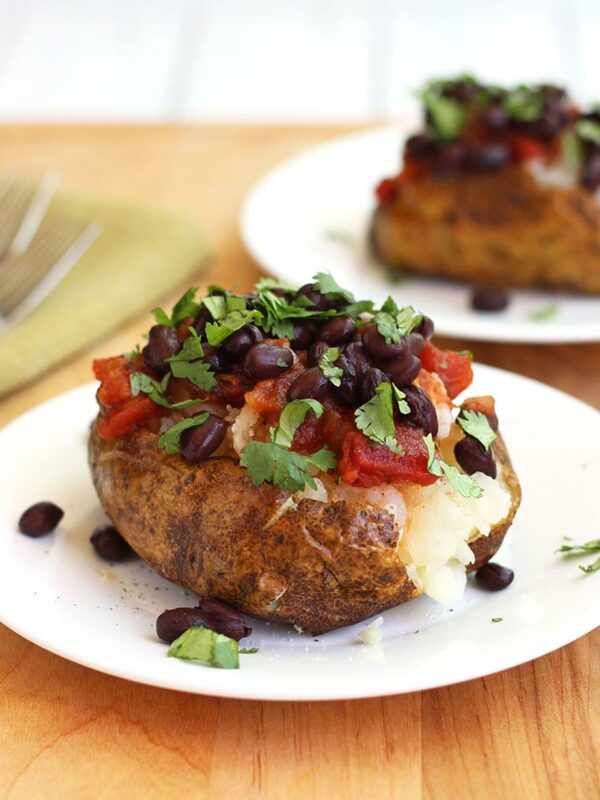 We suggest you have some type of starch as your staple and add veggies of your choice to it. Flavors can range from tomato basil to veggie stock, fresh herbs, curry, soy sauce, and more! Things like potato soups may take a little longer but are very filling – for a quick version, take some chopped frozen veggies and heat them up in some water, then add cooked legumes and spices. Serve over leftover starches or with a slice of bread. We also like lentil soups/dal and noodle soup where you cook a bunch of veggies in some broth and add rice noodles for the last couple of minutes. It’s a good idea to make a large pot that you can use up over the course of a few days! Try this roasted pumpkin soup, purple cabbage soup, and this creamy coconut caulifl﻿﻿o﻿﻿wer soup. Granted, these takes a little more time but it’s an amazing idea for your next batch cooking session! Unless you’re good with eating some of the patties “raw” before putting them into the oven. You need some precooked beans or lentils which you combine with some starch (cooked rice, pumpkin, and ground oats work well here) as well as a bunch of spices and you’re good to go! The mixture will already taste amazing and you can taste test it a couple of times before forming the patties or balls. Bake in the oven at 350-400°F for around 20-30 minutes (depends on the size and shape) and you’ll have a batch of patties or balls to munch on! Awesome for lunches on the go, too. Here are easy kidney bean burger﻿﻿s and some delicious vegan meatballs. Another type of dish that can include almost anything you find in your fridge! We like to use broccoli, mushrooms, bell pepper, onion, sweet potato, kale, and eggplant for meals like this. Just wash and cut your produce, place it on a baking sheet and bake or roast for around 20 minutes – but make sure nothing gets burned! This leaves you enough time to prepare a starch to go along with it if you don’t have any leftovers. Quinoa, white rice, couscous, polenta, or millet will all be done in 20 minutes or less. If you like to add some tofu, make sure to press it first using a paper towel, then cut and marinate it (if you don’t like the flavor or plain tofu!). Soy sauce, hot sauce, and teriyaki taste amazing! 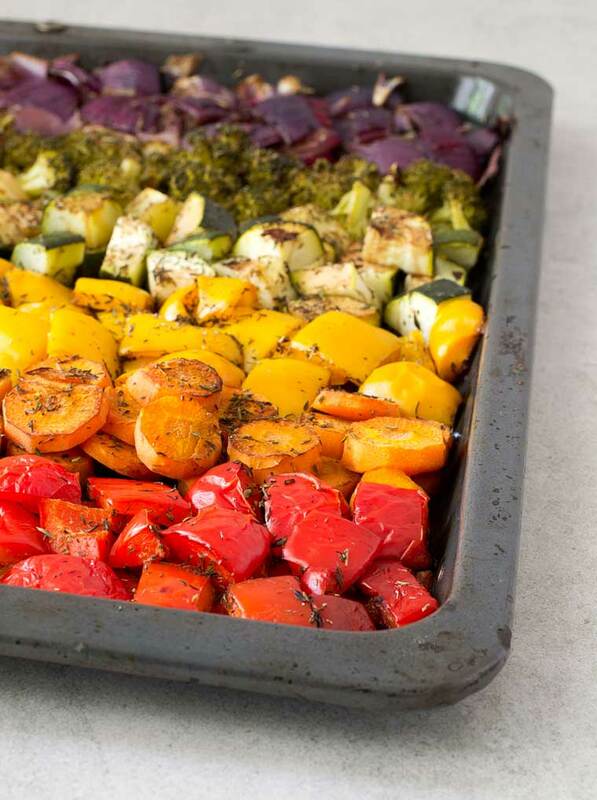 Pop into the oven together with the veggies for 20 minutes, until crispy. Marinara sauce (store-bought for extra laziness or quickly made at home), vegan cheeze sauce , oil-free bean pesto or Asian stir-fried veggies and soy sauce – these are just some of our favorites. You can also make c﻿urried noodle﻿s or peanut noodles! Tip: try a one-pot pasta so you’ll have less washing up to do! Alright, this might not be considered a proper lunch or dinner – but what if you’re in the mood for a sweet-ish snack or breakfast on the go? 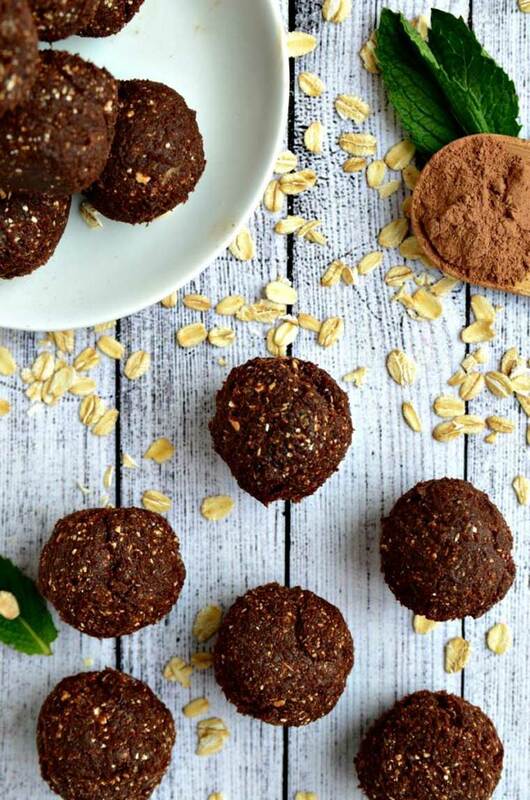 Energy balls are super quick to prepare and easy to make a huge batch of (only a good idea if you can keep yourself from eating 20 at a time!). Ingredients can include oats, nuts, dried fruit, nut butters, coconut flakes, pumpkin puree, seeds, puffed grains, and chocolate chips – adding flavors and spices of your choice, like cacao powder, cinnamon, vanilla, matcha powder, zest, even some chili powder. Though some recipes call for it, we’d recommend staying away from coconut oil and not using more than just a hint of refined sugars like maple syrup to make sure you’re on the healthy path here. Some delicious combinations include oats, pecans and dates as well as cacao, hemp seeds and peppermint. We hope you liked our ideas and that these meals will make starting and sticking to a healthy plant-based diet a joy and breeze for you. Let us know below which ones became game changers for you and your family! Oh wow, I just noticed that you have training in Music Therapy! I am reading this, having nearly finished my day, at my job as a Music Therapist in a Special School in the UK! Thank you for your wonderful recipes, my husband and I have quite similar ones on rotation, though I have a naughty “cheesy” pasta one for when we’re feeling decadent! what a lovely coincidence! 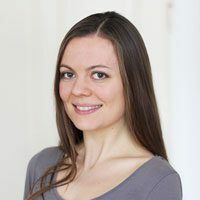 My training dates back 9 years now and I never really worked in this field, unfortunately – I chose to go back to university to study Social Work because it’s so closely related. And now I’m running a plant-based website, haha! Funny how things go in life. But this music therapy training was very valuable for my personal life and development, for sure. Do you love your work? A great list of vegan recipes for beginners. I would like to add another recipes as sweet and salted corn, fried French beans and teriyaki mushrooms. The recipe takes only 20 minutes and won’t consume any time. Great & easy ways to cook vegan recipes. As a traveler I always looking for easy way to cook hopefully I have got your ideas this will save my time also. Thanks for your valuable tips. I’m starting my vegan journey this month! Very excited and this information just made me feel even more confident in my decision. I have a one year old and he has been drinking soy milk since after breastfeeding for two months. He had cow’s whole milk for a week after turning one and developed eczema so I switched him back to soy. That experience really opened my eyes to a plant based lifestyle for me and my baby. Thank you for your guidance and I can’t wait to try these mouth-watering meals! !